Kenny was born in a small southern New Jersey town, Glendora, in 1970, a time period when very little was known about his skin condition (ARCI-lamellar type ichthyosis), and even less known about its treatment. His childhood, once depicted in a documentary entitled “Kenny”, was admittedly not ideal, as he not only was singled out for his skin condition, but was also the child of divorce at a very early age. However, to his good fortune, Kenny was surrounded by the love of a supportive older brother, and a mother to whom he gives a world of credit for his upbringing. “Raising a child with a rare condition that no one has ever heard of, virtually on her own, my mom never once let on that she was anything less than strong and confident,” he said. And, she taught him one of the most valuable lessons of all: Do not pity yourself. Respect yourself, and always present well. And present well he does. 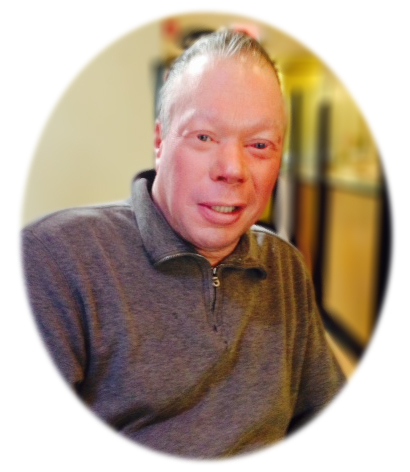 Although Kenny admitted over the years he has experienced dark periods of frustration and low self-esteem, he now feels his life experience, including his ichthyosis, has brought him to a place of acceptance, with a good dose of wisdom. He is a friendly, well-spoken gentleman, with a new perspective on life, and an enviable passion for his work. “In a way, I am blessed to be around trauma,” Kenny proclaimed. Although Kenny’s degree is in interior design, he feels compelled to help people on a deeper level. As the business supply coordinator for the trauma unit at Cooper University Hospital, he has ample opportunity to connect with people in a very deep and meaningful way.